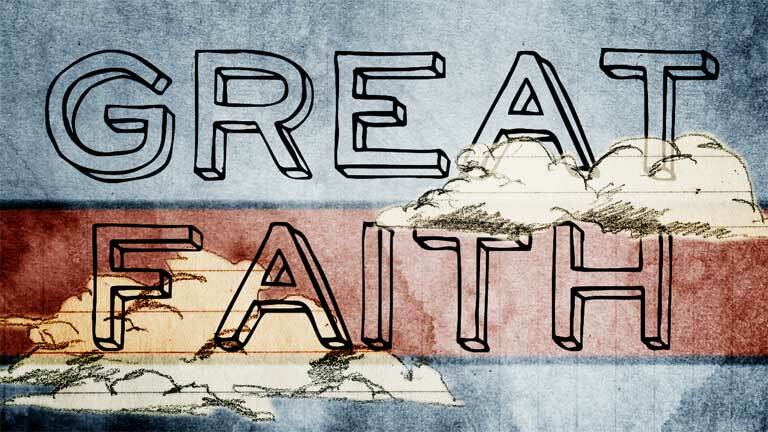 What’s the Difference Between Great Faith and Little Faith? “Now faith is the assurance of things hoped for, the conviction of things not seen,” (Heb 11:1). Everybody has faith in something, even the most diehard skeptic. The question is whether or not that faith is in the right place and of the right amount. The Scripture tells us that the right place for our faith to be in is in God, particularly in the person and work of Jesus Christ. Throughout the Gospels, Jesus himself calls people to have faith in God. Sometimes their faith in God is great, and other times their faith is little. What is the difference between the two? This question is important for us to answer because we want to be faith-full and not faith-less. In fact, it pains me to think that Jesus would turn to me and say, “Oh, you of little faith.” Yet, undoubtedly He could do so on a regular basis. 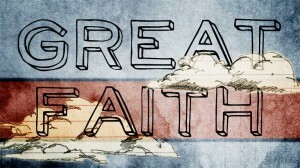 So, how can I, how can we, move from little faith to great? Ten examples from the gospel of Matthew are helpful to that end. In this Gospel, we see five examples of little faith and five examples of great faith. I’m praying the contrast will demonstrate the difference and help us pursue great faith. 25 “For this reason I say to you, do not be worried about your life, as to what you will eat or what you will drink; nor for your body, as to what you will put on. Is not life more than food, and the body more than clothing? 26 “Look at the birds of the air, that they do not sow, nor reap nor gather into barns, and yet your heavenly Father feeds them. Are you not worth much more than they? 27 “And who of you by being worried can add a single hour to his life? 28 “And why are you worried about clothing? Observe how the lilies of the field grow; they do not toil nor do they spin, 29 yet I say to you that not even Solomon in all his glory clothed himself like one of these. 30 “But if God so clothes the grass of the field, which is alive today and tomorrow is thrown into the furnace, will He not much more clothe you? You of little faith! 31 “Do not worry then, saying, ‘What will we eat?’ or ‘What will we drink?’ or ‘What will we wear for clothing?’ 32 “For the Gentiles eagerly seek all these things; for your heavenly Father knows that you need all these things. 33 “But seek first His kingdom and His righteousness, and all these things will be added to you. 34 “So do not worry about tomorrow; for tomorrow will care for itself. Each day has enough trouble of its own. 5 And the disciples came to the other side of the sea, but they had forgotten to bring any bread. 6 And Jesus said to them, “Watch out and beware of the leaven of the Pharisees and Sadducees.” 7 They began to discuss this among themselves, saying, “He said that because we did not bring any bread.” 8 But Jesus, aware of this, said, “You men of little faith, why do you discuss among yourselves that you have no bread? 9 “Do you not yet understand or remember the five loaves of the five thousand, and how many baskets full you picked up? 10 “Or the seven loaves of the four thousand, and how many large baskets full you picked up? 11 “How is it that you do not understand that I did not speak to you concerning bread? But beware of the leaven of the Pharisees and Sadducees.” 12 Then they understood that He did not say to beware of the leaven of bread, but of the teaching of the Pharisees and Sadducees. 14 When they came to the crowd, a man came up to Jesus, falling on his knees before Him and saying, 15 “Lord, have mercy on my son, for he is a lunatic and is very ill; for he often falls into the fire and often into the water. 16 “I brought him to Your disciples, and they could not cure him.” 17 And Jesus answered and said, “You unbelieving and perverted generation, how long shall I be with you? How long shall I put up with you? Bring him here to Me.” 18 And Jesus rebuked him, and the demon came out of him, and the boy was cured at once. 19 Then the disciples came to Jesus privately and said, “Why could we not drive it out?” 20 And He *said to them, “Because of the littleness of your faith; for truly I say to you, if you have faith the size of a mustard seed, you will say to this mountain, ‘Move from here to there,’ and it will move; and nothing will be impossible to you. 5 And when Jesus entered Capernaum, a centurion came to Him, imploring Him, 6 and saying, “Lord, my servant is lying paralyzed at home, fearfully tormented.” 7 Jesus *said to him, “I will come and heal him.” 8 But the centurion said, “Lord, I am not worthy for You to come under my roof, but just say the word, and my servant will be healed. 9 “For I also am a man under authority, with soldiers under me; and I say to this one, ‘Go!’ and he goes, and to another, ‘Come!’ and he comes, and to my slave, ‘Do this!’ and he does it.” 10 Now when Jesus heard this, He marveled and said to those who were following, “Truly I say to you, I have not found such great faith with anyone in Israel. 11 “I say to you that many will come from east and west, and recline at the table with Abraham, Isaac and Jacob in the kingdom of heaven; 12 but the sons of the kingdom will be cast out into the outer darkness; in that place there will be weeping and gnashing of teeth.” 13 And Jesus said to the centurion, “Go; it shall be done for you as you have believed.” And the servant was healed that very moment. 1 Getting into a boat, Jesus crossed over the sea and came to His own city. 2 And they brought to Him a paralytic lying on a bed. Seeing their faith, Jesus said to the paralytic, “Take courage, son; your sins are forgiven.” 3 And some of the scribes said to themselves, “This fellow blasphemes.” 4 And Jesus knowing their thoughts said, “Why are you thinking evil in your hearts? 5 “Which is easier, to say, ‘Your sins are forgiven,’ or to say, ‘Get up, and walk’? 6 “But so that you may know that the Son of Man has authority on earth to forgive sins”—then He *said to the paralytic, “Get up, pick up your bed and go home.” 7 And he got up and went home. 8 But when the crowds saw this, they were awestruck, and glorified God, who had given such authority to men. 18 While He was saying these things to them, a synagogue official came and bowed down before Him, and said, “My daughter has just died; but come and lay Your hand on her, and she will live.” 19 Jesus got up and began to follow him, and so did His disciples. 20 And a woman who had been suffering from a hemorrhage for twelve years, came up behind Him and touched the fringe of His cloak; 21 for she was saying to herself, “If I only touch His garment, I will get well.” 22 But Jesus turning and seeing her said, “Daughter, take courage; your faith has made you well.” At once the woman was made well. 27 As Jesus went on from there, two blind men followed Him, crying out, “Have mercy on us, Son of David!” 28 When He entered the house, the blind men came up to Him, and Jesus *said to them, “Do you believe that I am able to do this?” They said to Him, “Yes, Lord.” 29 Then He touched their eyes, saying, “It shall be done to you according to your faith.” 30 And their eyes were opened. And Jesus sternly warned them: “See that no one knows about this!” 31 But they went out and spread the news about Him throughout all that land. 21 Jesus went away from there, and withdrew into the district of Tyre and Sidon. 22 And a Canaanite woman from that region came out and began to cry out, saying, “Have mercy on me, Lord, Son of David; my daughter is cruelly demon-possessed.” 23 But He did not answer her a word. And His disciples came and implored Him, saying, “Send her away, because she keeps shouting at us.” 24 But He answered and said, “I was sent only to the lost sheep of the house of Israel.” 25 But she came and began to bow down before Him, saying, “Lord, help me!” 26 And He answered and said, “It is not good to take the children’s bread and throw it to the dogs.” 27 But she said, “Yes, Lord; but even the dogs feed on the crumbs which fall from their masters’ table.” 28 Then Jesus said to her, “O woman, your faith is great; it shall be done for you as you wish.” And her daughter was healed at once. Did you notice the difference? The difference could be summarized in these three statements. 1. Little faith is stifled by fear while great faith is amplified by boldness. Peter shows us what fear does to faith as he doubted while walking on the water (Mt 14:22-33). He indeed started out boldly, but fear stifled his faith so that he began to sink. In contrast, the woman with the issue of blood boldly went forward and touched Jesus (Mt 9:18-22). She didn’t wait and ask. She boldly acted. The same can be said for the blind men who boldly cried out and followed Jesus uninvited into the house seeking healing (Mt 9:27-31) and for the Canaanite woman who broke all protocol and approached the Jewish Jesus, pleading for her daughter’s healing (Mt 15:21-28). 2. Little faith focuses on the material world while great faith focuses on the spiritual world. The audience Jesus was preaching to in Matthew 6:25-34 was prone to worry about material things such as food and clothing. Jesus tells them to seek first God’s kingdom and righteousness, which is spiritual. In a similar vein, the disciples who were caught in the boat in the storm could only focus on the water and the wind, the waves and the lightning, but there was Jesus asleep in the same boat (Mt 8:23-27). They were focusing on the material while He was focusing on the spiritual, in that He knew the Father was protecting them from the storm. Finally, perhaps the best example of this contrast is the disciples in Matthew 16:5-12. Jesus tells them to beware of the leaven of the wicked religious leaders, and they think He’s talking about actual bread. 3. Little faith makes decisions based on what is possible for humans while great faith makes decisions based on what is possible for God. That same conversation we finished the second difference with also illustrates this point. The disciples are worried about getting some bread but are forgetting that the One who just fed 5,000+ with five loaves of bread and then 4,000+ with seven loaves of bread was in their midst. Indeed, He could have turned stones into bread, but they were making decisions based solely upon what is possible for man. The same is true for the disciples when they tried to exorcise the demons from that boy (Mt 17:14-21). It seems that they were relying upon their own power instead of God’s. On the other hand, the centurion made his decisions based upon what is possible with God (Mt 8:5-13). In fact, he believed that Jesus didn’t even have to be in the presence of his son to heal his son, which was totally true. Only God can do that, and the centurion believed it. It is likewise with the men who brought the paralytic to Jesus (Mt 9:1-8). If they had focused on what humans can do, they wouldn’t have put forth the effort. However, they set their sights on what God can do and toted their friend to Jesus. In fact, we learn from Mark 2:4 that in order to get their friend to Jesus, these men had to tear a hole in the roof of the house Jesus was in because it was too crowded around the door. They weren’t going to miss what God can do! Interesting comparison of great and small faiths. I am grateful that God still acts out on our small faith. Thank you made it more clear.